I don't think such a point exists. The Amount pot is practically where the signal enters the circuit. Also, regarding "either side of D1", yes the signal will be mostly the same, but the diode is there for reverse voltage protection. I assume if you add an out and accidentally plug the wrong thing in there you could damage your envelope circuitry. Oh I hope not! I think it's more of a precaution than anything, especially when on a modular it's so easy to patch the wrong cable in. But I guess there's only one way to find out. Took my wire away from D1 checked the soldering , seems ok.
the env follower doesnt work internally in the SOST no more. I don't know how many SOST have been built over the years. I just finished building one and I found that the ENV- follower was not working properly. It was more like a comparator with no threshold. According to LTSpice changing R61 from 1K to 100K makes it much better. Will check that in the module soon. I checked everything in real life now. R61 must be changed from 1K to 100K to make the envelope follower work properly. With 1K it works more or less like a comparator, holding the inverting input of the OpAmp at almost 0V. Accordingly one has to change R5 from 470K to 100K to have a decent impact onthe modulation. do you run your SOST on 12V or 15V? I built the SOST for my 5U / 15V system, and I always thought the ENV works fine, but I will check again. Maybe you could run Spice sim. with 15V as well? I run on 12V, but that does actually not make any difference. 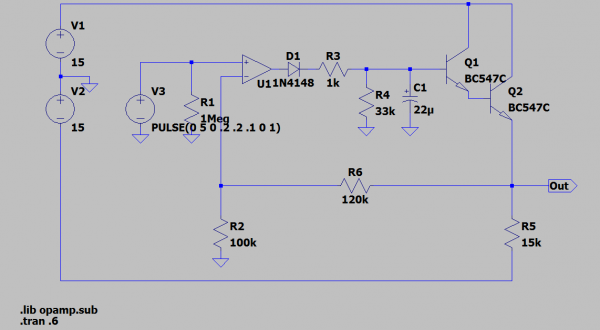 With just 1K to GND on the inverting input the opamp works as a comparator. the result is a kind of sloped gate, which of course has an effect in the end. but it is not an envelope follower and it will shoot as soon as you turn the ENV knob away from CCW. This is also what I got from this single and only useful demo on youtube, where a guitar player demoes it. And he states almost exactly that. This or I got something terribly wrong in general, which I do not believe at this point. BTW you could compare the envelope follower in the SOST with the envelope follower in the MS20 and you will quickly spot it. I will try changing the resistors tomorrow and make a before/after comparison. So theoretically ...if I put e.g. a sequencer line into the SOST and vary the input level, the flanging sweep then should also vary a lot more than before. With the old resitor values it stays more or less static. Is that correct? theoretically yes. however, the settings are a little bit fiddly and as you can hear in my video above, the effect is more noticable with slow changes. with the old values i actually had the input audio modulating the flanger since the comparator switched at every zero crossing (at audio rate!). I changed both R61 and R5 and now the ENV Mod potentiometer is way more useful than before. It now feels like a modulation amount knob like it should be, before it was kind of the same sound over the whole knob range. And you're also right: it is a bit more fiddly to use envelope modulation on the SOST (or any flanger?) than on some filter. Doesn't sound "right" on every signal. Just compared the schematics of SoST-Flanger with the original StormTideFlanger - Jürgen used the same Envelopefollower back then. So he made the same mistake twice? It obviously is a mistake. The R61 (R2 in your simulation) has to be in the 100K ballpark, not just 1K.